It is true that since the world of tatting has been invaded by so many coloured threads to choose from and the delight of adding beads and whatever you like to tatting, I have had an absolute ball! In fact I got to the stage when a picot could not be naked! It had to be joined to something, have a bead or beads on or failing that the picots had to graduated. 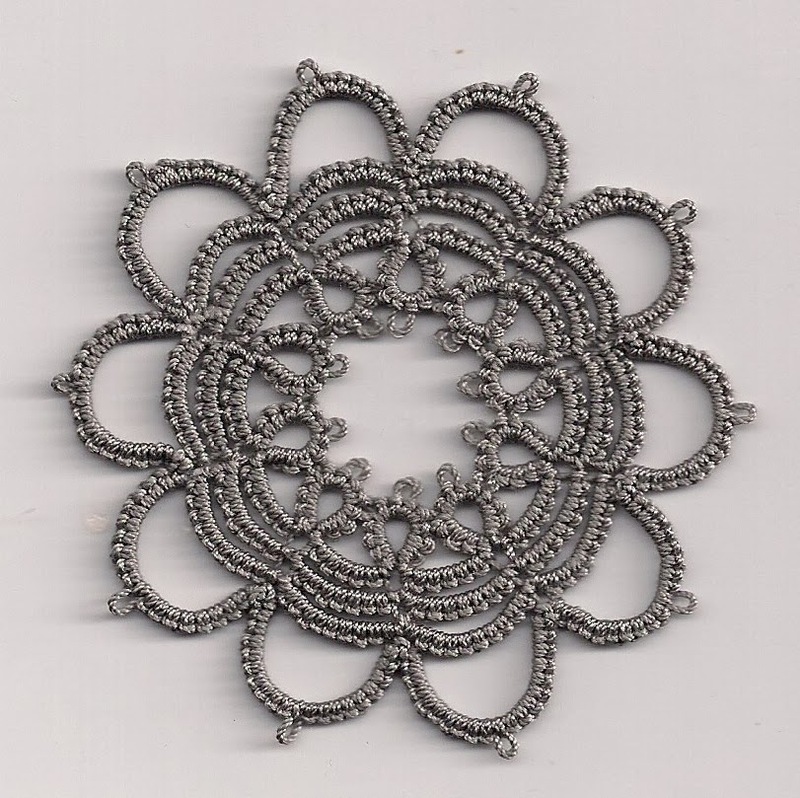 Recently I had been seriously thinking of making a doily, particularly as there is an Art Exhibition coming up in July and it would be a piece of tatting to 'show of'. Now you can count the amount of doilies I have actually made on one hand, they are not what I usually enjoy tatting. Although I do enjoy seeing the beautiful ones that other people have made. So Maureen's comment 'Maybe this is the year you need to try one of Renulek's enormous doilies?' rather stopped me in my tracks. Then just by chance Renulek posted a beautiful set of doilies on her blog and today she started the pattern instructions. So that it is I am off, although could not decide on the colour and wonder if I will actually stick to the same all the way through, but who knows? Renulek promises to post the next bit of her pattern tomorrow but I know I will not be able to keep up. I also thought of doing a split chain to climb into the next round but as I was coming to the end of my shuttle thread decided to finish off completely. I am also beginning to understand why Maureen said 'enourmous'! On Saturday I was trying to teach five ladies how to tat, they were finding it very hard to get the basic technique so I have sent them home to practise. They all attended the class with the idea that that tatting was relatively easy as I produce so many items, they have gone away with quite a different perception, well for now! Good luck- great start!!! I'll have to live vicariously! Thanks, I don't know if I ever will complete it though! Pretty centre. And great colour thread! I saw this pattern on Renulek's blog this a.m. and of course want to tackle it too! I wonder how big this one will be. Fox I think it is going to be pretty big especially as I am using Coats 20 and it is slightly thicker than the Lizbeth thread, it is soon going to be off the scanner that is for sure! Actually I am enjoying the freedom of no beads! I had to run straight over to Renulek's blog to see the new doilies. because I didn't know about them! Aren't they lovely? - but I must not become sidetracked as I'm working on wedding hanky for my daughter in 80. It's been giving me a few problems, but I'm crossing my fingers for a good result. The thing about tatting is that I just enjoy doing it! - so, for me, working on a very big project one day would be perfect,because at the end of it all there is a worthwhile piece to show for it. I think if you saw one of the huge doilies and thought about the work involved, you wouldn't even begin! Good luck with the Hanky Maureen, I am sure it will be well worth the effort. Yes I am trying not to the of the work involved in this doily and just take it slowly and enjoy! I love the look of tatting with beads, of course, but I have to admit they can be a pain to work with on the shuttle thread. To be honest, I usually have more fun tatting without them. A Renulek doily, eh? I've never tackled one of those; I'm not sure I have a long enough attention span. I always admire them when Fox makes, them, though; and I do think that her choices of when to change colors really accentuate the patterns. Changing colors might also help you maintain your interest. Something to think about. I'm sure your students will soon be wondering what the difficulty ever was! I don't know your approach to teaching, but personally I think it's easier to learn chains before rings, and to use two different colors of thread. This helps people to see which thread is which and visually understand the flip. The attention span does rather worry me Miranda, but it will be done at odd times with little breaks for other things! Don't sure about chaning colours yet. Yes I started my students off with chains and different colours, it isn't an easy craft to teach! The doily you have started is gorgeous! Now I'm tempted to pick that up too, but there are items on my plate. I'll be watching out for yours as it develops. Haha, who said tatting was easy?! Hope your students do their homework and come back for more. Definitely didn't regret picking up tatting. I only had this day (and half a day for two of the students) to teach them and it really isn't enough, which means that there has to be regular teaching lessons sometime in the near future. But not sure when I can fit them in! I enjoyed tatting one of Renulek's doilies. I laughed about the ladies battling with their tatting - things often look easy when an expert does them! I hope they will get the hang of it and not be put off by the difficult start. Renulek's doilies look so much fun which is why I thought I would have a go. I am sure it was very frustrating for the ladies not picking up tatting as quickly as they hoped, sort of reflected on me as I wondered what else I could do to help them. I really like the start of this Sally. And I do like the grey too. I've been tempted to try Renulek's doily also, but I haven't been able to decide which thread to use. That grey is lovely!